Leh & Ladakh regions are some of the most captivating parts of Jammu & Kashmir. There are many places in and around Leh which opens the door to the world of Buddhism and natural wonders with astonishing beauty. On the arrival at Leh Airport, you will assist by our friendly tour representative. You will transfer to the hotel. On the arrival at hotel, check-in and relax. You can spend your day comfortably in your luxury room. Or you can visit Leh Market and Shanti Stupa in the evening. Enjoy your meals in the hotel and overnight stay. After breakfast, relax for a few minutes and get ready for Leh Sightseeing. Your sightseeing will start from Hall of Fame which is on the way of Kargil Roda. Hall of Fame is one of the most popular destinations in the region that s worth to visit by all the people. The museum has collection of rare things and was built by Indian army. Other places of tourist interest are Kali Mata Temple, Spituk Gompa of Ladakh and other scenic landscapes. You will also visit three-chapel monastery well constructed with incredible architectural design. 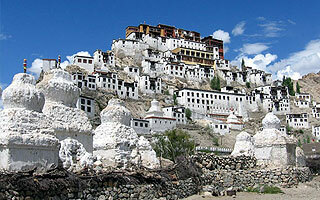 The monastery is situated at a drive of around 8 kilometres from Leh town. Another site you will explore in the destination is Gurudwara Patthar Sahib. It is nestled between the sky-touching Himalayas. The building was constructed in the year 1517 by the Lamas. You will discover the beauty of Magnetic Hill situated at a drive of 4 kilometres. En-route you will enjoy scenic beauty of Mother Nature, Now, drive for 4 kilometres again and you will be at the shores of Zanskar river. You will also visit picturesque Nimmu village. Discover the captivating sites and make your visit adorable moment. Back to the hotel and overnight stay. After breakfast, get ready for excursion to Nubra Valley. En-route you will visit Khardung-La which is the highest motorable road in entire world. The location is situated at a height of 18,390 feet and it is situated at a drive of 39 kilometres from Leh. 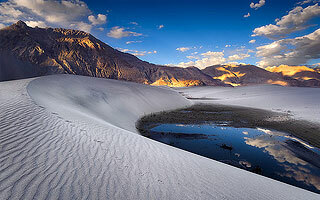 Scenic places of Nubra Valley all the time attract the attention of domestic and foreign visitors. The valley is also familiar as Ldorma and the Valley of Flowers. The valley is located to the North of beautiful Ladakh between the lovely Karakoram and Ladakh ranges of the charming Himalayas. In the afternoon, you will visit Hunder Monastery which is one of the most eye-catching monasteries in the world. 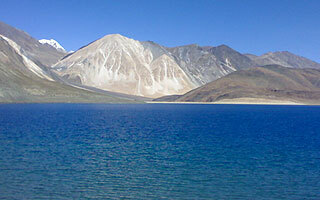 It is located very near to the India and Pakistan Border in the north-western direction of Ladakh. Or, you can also visit wide Sand Dunes to enjoy entertaining Camel Safari. After breakfast, get ready for drive towards Leh. En-route you will visit charming Diskit Monastery. The Diskit Gompa located in Leh Ladakh was constructed during the 14th Century. An elevated Cupola of Diskit Monastery is the most attractive structure. An elevated cupola is well adorned with incredible fresco that demonstrates the Tashihunpo Gompa of Tibet. Places of tourist interest in the complex are Kangyu-lang and Tsangyu-lang. In and around the complex you will discover numbers of Mongolian and Tibetan texts inside the sacred temples. After breakfast, get ready for excursion to Pangong Lake. En-route you will visit Shey Palace which was served as the ancient capital of Thiksey and Ladakh. Your attention will surely magnetize by the impressive features of complex. On the route to Pangong Lake you will drive through Changla Pass. Stunning Pangong Lake is located at a height of 4,267 metres above the sea level. The beautiful site is situated near to India and China Border. Travel in and around the scenic locations of the Lake and make the moment an unforgettable experience. Enjoy lip-smacking lunch at Pangong. Spend lovely evening in the lap of Mother Nature. Rejuvenate your mind, body and soul in such scenic beauty site. After breakfast, get ready to leave Pangong and drive towards Leh. En-route you will visit Hemis Gompa. Hemis Gompa is the largest monastic foundation in the region. Discover the exceptional features of the site with great fun and entertainment. After breakfast, get ready for check-out from the hotel. Our tour representative will transfer you to Airport to catch flight for your further journey. Tour ends here.